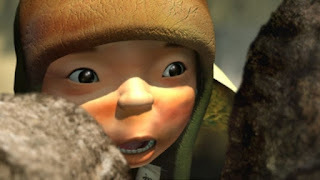 Short animated film about a young boy in 1951 Korea dreaming of fighting the war that is raging in his country. He is playing war games of a lonely sort on his way home. Bittersweet film will probably strike most as well done but unbelievably sad. I liked it but didn't love it, finding the sadness over whelming my feelings for the film. Some films are too sad to say that one enjoyed them even if they are that good. Nominated for best short animated film it lost the Oscar to RYAN the animated documentary about Ryan Larkin. Worth a look if you run across it since it is a very beautiful film at times.